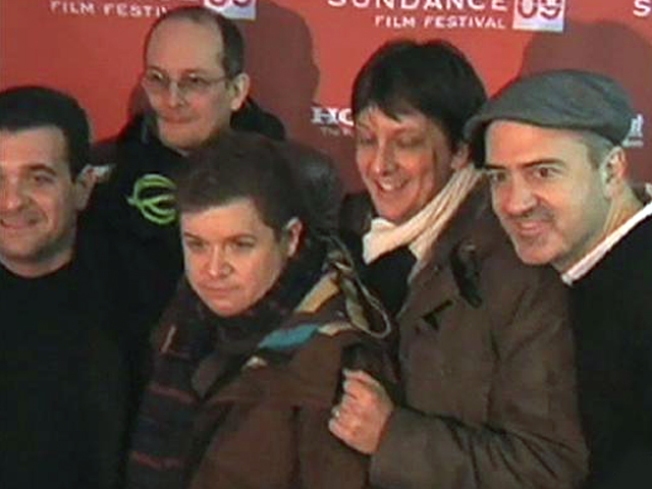 Some members of the "Big Fan" cast and crew pose for a picture at this week's Sundance Film Festival. One of the dozens of movies debuting at this year's Sundance Film Festival is "Big Fan," a made-in-New-York indie picture. First-time director and Long Island native Robert Siegel tapped funnyman Patton Oswalt and indie veteran Kevin Corrigan as his lead actors, a pair of New York Giants die-hards who eat, sleep and drink football. "Big Fan" examines the fine line between loyal devotion and unhealthy obsession, and although neither Oswalt nor Corrigan is a big sports fan, each was each able to relate to his character. "One thing we were talking about with Robert was that everyone is obsessed with something," Oswalt said. New York native Robert Siegel debuted at the Sundance Film Festival this week "Big Fan," his story about two crazed New York Giants football fans. Siegel said when he was a kid, he'd slip under the covers at night and listen to sports talk radio, hearing from crazed fans with their ridiculous rants. Whether the Academy comes calling, Siegel said making movies with a New York state of mind is what he strives for.